Most early recordings of Gregorian Chant, with the exception of those from Solesmes, have fallen into total obscurity. Now, Parnassus resurrects more than 2 ½ hours of recordings made from 1928 to 1936 at a variety of locations throughout Europe. Only two of these items have ever been previously available on LP, and none on CD. To make the anthology as useful and informative as possible, compiler Jerome F. Weber has provided a lengthy discussion of the styles and backgrounds of all of the performing choirs, along with complete texts and translations of the Chants. The transfers from scarce 78s have been done by the legendary engineer Richard Burns, co-inventor of the Packburn Transient Noise Suppressor. The result is a highly listenable, fascinating compilation that will capture the interest of any Chant lover. “Gregorian Chant: The Early Interpreters” was featured on Public Radio’s “Millenium of Music” show late January 1999. What a wonderful treat it is today to be able to listen to these pioneer performances of monody! 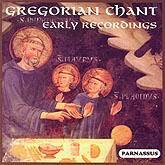 This interesting selection, put together by Jerome Weber, who is well-acquainted with the world of phonographic recordings of Gregorian Chant,has an important his torical role. The pieces are witnesses in sound to the schools which, after. Pope Pious X’s Motu Propio, adopted this type of chant for their liturgical ceremonies, using a style more or less borrowed from Solesmes. We find here all kinds of performances by both monastic and secular choirs, by those associated with religious centers and by those associated only with conservatories or music schools, a capella perfor mances and performances accompanied by organ, as was highly fashionable at the beginning of the century (producing some curious harmonies! ), sung by male, female, and even children’s choirs — as is the case in the performance by the Montserrat choir school, recorded in 1930 under the direction of the legendary David Pujol. It is amazing how much aesthetic tastes have changed! Current recordings, in many ways more stark and purified, are sometimes colder than these versions. While it is true that in most cases the perfomances are quite slow, on occasion, the lively rhythm which some choirs transmit to these chant pieces surprises, for example in the versions by the Schola Cantorum of Paris, directed by Amedee Gastoue, one of the fathers of the study monophonic music on this century. Just seeing the name of the famous Justine B. Ward, who directs the choir of the Pious X Music School, immediately reminds us of another: Andre Mocquereau, without whose work these versions would have been impossible. Suitable only for lovers of the Gregorian repertoire.